1. What are some of the programs that Metrocrest Services offers? We offer emergency rent and utilities assistance, food pantry, employment counseling, financial education, senior services like home delivered meals, People and Nutrition ( PAN) which is a pantry program that helps low income seniors, and transportation services. We also have seasonal programs such as: Sack Summer Hunger which feeds children during the summer who do not get free and reduced lunch meals due to summer break, Back to School which provides grade and school specific supplies, uniform pieces, backpacks, health and dental screenings, hair cuts, eye exams and glasses for the children that need them. Thanksgiving and Holiday programs that give ample food boxes and holiday gifts and toys to families in need. 2. What are the various positions that a volunteer at Metrocrest Services can hold? How do volunteers at Metrocrest Services help the community? Volunteer positions range from helping our seasonal programs by packing and sorting items, sorting donation drive items, and helping our Metrocrest ReSale store. When volunteers donate their time to us, they help the community by helping to staff and facilitate the programs. We utilize about 4,000 volunteers per year many of them interact with clients directly ensuring that the clients are served with dignity and respect and get served efficiently and accurately. 3. Why are personal hygiene and household items a significant need at Metrocrest Services? Personal hygiene items are key to our food pantry model which is known as “client choice, pantry plus” the plus are the hygiene and household items. We realized years ago that if our neighbors in need are experiencing issues with food insecurity than they will need help with household items as well. Household and hygiene items are often more expensive and are not included on the approved list of items that can be purchased with SNAP or WIC benefits. 4. If you could only tell someone one thing about Metrocrest Services, what would it be? I would tell them that Metrocrest Services’ truly lives our mission statement to deliver services and programs that will get our clients out of poverty and back to self sufficiency with dignity and respect. 5. How does Metrocrest Services benefit individuals, the community, and the world? Metrocrest Services has existed for over 40 years, and is committed as an agency to helping our local community and the individuals by treating the whole needs of the person. All of our programs are designed to help assuage the immediate need of a client and help them with supplemental programs to address and hopefully avoid the same situation in the future. For example, a client coming to us for rent assistance may do so because they do not earn enough to help make ends meet. We will help get their rent paid but provide financial coaching to help them budget, as well as employment assistance or GED training to help them improve their employment prospects. Our investment in our neighbors in need helps lift up our community at large. 6. How will the donations of personal hygiene and household items (toilet paper, feminine hygiene products, shampoo, bath soap, toothpaste, deodorant, and laundry detergent) impact Metrocrest Services (and the community) in the future? The donations of items will ensure that we can keep our shelves in the pantry full, meaning that we can fill the shelves of our neighbors in need. Unfortunately, the need will never go away but we strive to help as many people as possible. 7. How can people continue starting donation drives for personal hygiene and household items for Metrocrest Services in the future? Individuals are welcome to donate items at any time during our operating hours. People who are interested in doing a large scale drive such as a Gold Award project or a corporate drive are encourage to contact myself or the program manger Bev Grimley so that we can help them plan for the logistics of the donation drive. We have flyers, posters, and agency donation boxes to assist in their efforts. 8. Which organizations/businesses/stores work with Metrocrest Services? We are supported by many grocery stores such as Wal-Mart, Whole Foods, Sprouts, the Coppell Farmers Market and Community Gardens, and many more. Which encompasses Farmers Branch, Carrollton, Addison, Coppell, and small part of Denton in Dallas County. We also service families whose children attend school in the Coppell or Carrollton/ Farmers Branch independent school districts. 10. 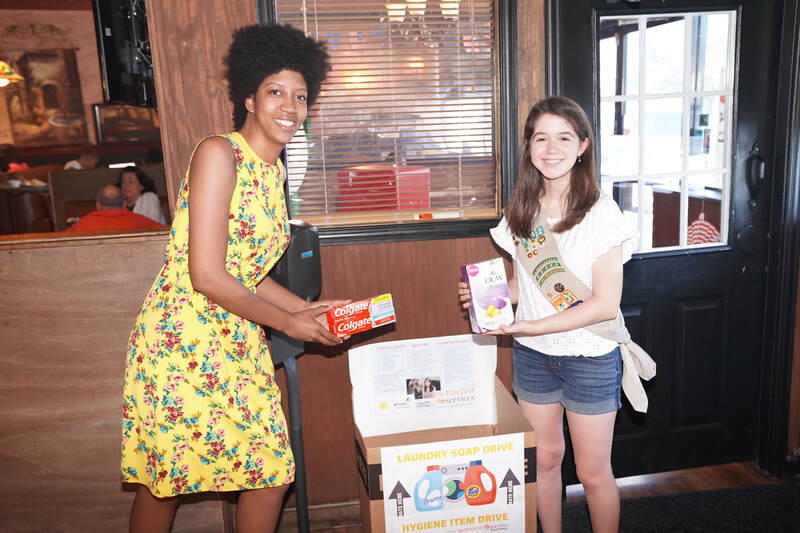 Can organizations such as the Girl Scouts of the USA, schools, church groups, and youth groups volunteer at Metrocrest Services? Yes, groups are welcome to serve. Groups interested in serving are welcome to contact Volunteer Manager Brittni Coe at 469-317-2541or bcoe@metrocrestservies.org she can help to find and plan a service activity. The minimum volunteer age for volunteers is 13 years old.